You are currently browsing the category archive for the ‘Grants’ category. 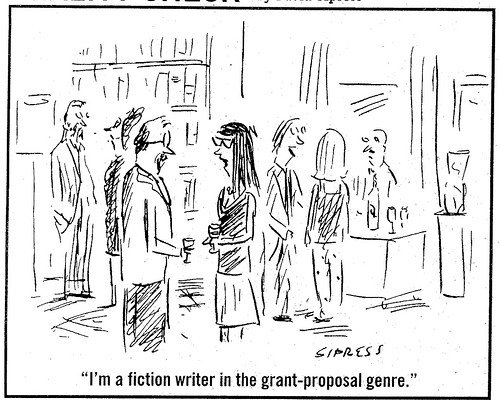 I had previously written about grant writing (here and here) in some depth and mused on it several times as well. This past summer, HRSA put out an RFP (request for proposals) for their training grants. These are difficult grants to write, requiring a lot of data and imagination. The success rate is typically about 50% and usually you have a matter of months to prepare them. We were given 3 weeks and identified three areas of need we felt we should apply for. So far, we have heard that we got two funded and are awaiting word on the third. The good news is that we will be given resources to completely transform the residency training program and the student program into programs that train physicians for the 21st century (only 10 years late). The bad news is that we have to now do the work. Wish me luck! As I sit on the Gulf Coast of Alabama, awaiting te arrival of the biggest environmental disaster of my lifetime, I am trying to anticipate what I will need to teach physicians to do to be effective in 2015 and have to admit I am drawing a blank. I am continuing to work on the HRSA Title VII funding request. The difficulty is that they have changes the number of years that the project should be developed over to 5. In the spring of 2005, Katrina was the name of a potential storm, the healthcare delivery system was to be market based, and primary care was seen by the feds (who paid a majority of the bills) to be a quaint method of providing low intensity health services that people probably didn’t need anyway. I’m glad I wasn’t asked to predict out for those 5 years. But I am being asked to predict what I will need to train physicians for the next 5 years. Maybe I should focus on the need for a different kind of doctor in 2015. One who can spend more time with the patients, helping them to navigate the system, working with them to make sure they are taking advantage of appropriate medical care (including preventive services), and delivering this care in a personalized manner. Oh, wait, we already have this type of provider. He or she is a family physician, underpaid and burned out under the current payment model. Unfortunately, I can’t write a grant to improve the payment structure. Maybe I should write a grant to deal with the lingering effects of the ecological disaster of cataclysmic proportions heading to a shoreline near you. We know from Katrina that there will be an increase in depression, physical ailments related to depression, as well as ailments related to exposure to hydrocarbons. In addition, folks will lose their ability to make a living off of the land, leading to more ill effects as described above. In the long run will be an increase in certain cancers. The grant I would like to write would have been one to point out that one shouldn’t drill holes that are too deep to plug up if something goes terribly wrong. Anyway, I still want to believe in miracles. This may, however, be the grant that I write. The other dilemma that is of potential interest to granting agencies is childhood obesity. The President’s Council on Physical Fitness began during the Eisenhower adminstration in part because of a concern that our young men and women were in no physical shape to fight another World War. After 60 years we noticed that it was working in the opposite way with the future fighting men and women of 2010 being more out-of-shape by far than their 1950’s counterparts. Doesn’t speak for the success of the President’s Council, does it. If only we had measures that worked better than eating less and exercising more. As a physician, not a lot of either activity takes place in my office so I’ll have to think about a medical approach to this problem for a while. Grant writing is hard work. The needs are often overwhelming and the solutions not forthcoming. I guess now it’s time to get back to my predicting on a much smaller scale.